Don Imus may be gone from CBS, but now everyone is working overtime to clean up the mess he left behind, and “Extra” has details on the all-new fallout. 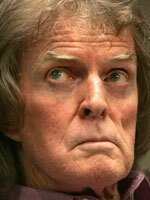 Also in support of Imus’ termination was Oprah Winfrey, who appeared on “Larry King Live” Monday night. “I have my own radio channel, and if someone on my radio channel had made such degrading remarks, I would have fired them,” she said. “Extra” learned today that Imus is leaning on his wife, Deirdre, for support, as she sits in and takes over the morning show mic for her exiled husband. “We hope to come to a healing at some point here,” the missus said. Deirdre, the best selling author of “Green This!,” met the radio mogul in 1992 when she auditioned for a skit on his radio show. They married two years later, and she was by her husband’s side Thursday night inside his private meeting with the Rutgers women’s basketball team. “The hate mail being sent to them must stop. These women and courageous and beautiful,” Diedre said of the collegiate athletes. So what’s next for the man with more than 40 years of radio experience attached to his name? We’re told CBS will take a $15 million hit by killing the syndicated Imus show… but the big question is who will replace him. Media Week’s Marc Berman gave “Extra” a few possible names. Do You Think Isaiah Washington Should be Fired?